Posted by Jeff (ILoveCapitalism) at 10:49 pm - March 5, 2013. Today the stock market, as measured by the Dow Jones Industrial Average, hit an all-time high of 14,283 (intraday basis; closing at 14,253). A broader measure of stocks, the S&P 500 index, also seems to be doing well as it closed at 1539, nearing its all-time high. So all is well in Obama’s economy, right? People are confident, great time to invest in stocks, right? Not necessarily. The economy’s fundamentals remain poor. I believe that the Federal Reserve Bank’s “Quantitative Easing” program, which pumps around $85 billion per month of newly-printed money into the financial markets, causes the stock market to go up irrationally. People know that America’s economic fundamentals are poor; but if the Fed is pumping so much money into the markets, then the markets are going to do well ‘no matter what’, at least for awhile. Realizing this, people feel a pull to join the party – after all, everyone else is doing it – and that makes markets go up even more. I don’t see how it can end well. I see it as another market bubble. When the Fed stops QE – and it will have to, eventually – the stock market seems more than likely to crash. Bubbles are terrific fun, while they last. That is the phase we’re in now: the drug-QE-induced euphoria. Posted by Bruce Carroll at 9:07 pm - March 5, 2013. The latest actor in the drama known as sequestration is none other than Charlie Brown. Actually, it’s Charles Brown, an official with the Animal and Plant Health Inspection Service (APHIS) office in Raleigh, N.C.
Mr. Brown sent an email to his superiors at the US Agriculture Department in Washington, DC, asking “if there was any latitude” in how he should spread the sequester cuts across his region to lessen the impacts on fish inspections. Mr. Brown’s response from DC is now making national headlines. Posted by B. Daniel Blatt at 7:08 pm - March 5, 2013. After delivering his election victory speech in November, Obama walked off the Chicago stage and made two phone calls related to his political plans — one to Israel and one to Rep. Nancy Pelosi (Calif.), the last Democratic House speaker. Israel said Obama told him “how focused he would be on winning a House majority for the Democrats,” many of whom complained that the president did not do enough during his first term to help members on the Hill. In other words, in the immediate aftermath of his election victory this past November, the president already started looking ahead to the next election. Since the people didn’t elect the Congress he wanted, he chose to start focusing on electing that Congress, even if the 2014 elections were two years hence. No wonder he is blaming the sequester on the current Republican House even though he made little effort to work with the leaders of that chamber after it passed the “fiscal cliff” legislation at the end of the last Congress, delaying the sequester until last week. Posted by B. Daniel Blatt at 1:12 am - March 5, 2013. We gay men, like our straight counterparts,appreciate seeing images of ourselves in literature and film that correspond to a more idealized version of ourselves, not necessarily perfectly idealized, to be sure, but at least characters who have a (somewhat) noble demeanor and show a bit of derring-do — and maybe manifest a few of our flaws. All too often alas, in literary fiction, we see too many gay men depicted as whiners, victims of an unfair society or, in mainstream and science fiction, as lonely people who live apart from their peers, rarely connecting with others and never succeeding in romance. 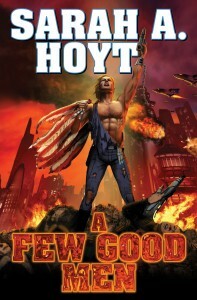 In Sarah Hoyt’s A Few Good Men, a science fiction novel set in a dystopian future on earth, , however,we have a gay hero who very much has that derring-do and even has a few of flaws common to most mortals, a man who suffers the loss of one lover, but finds in another both the companionship that we all crave and the encouragement that we all need. The book is a fast and a fun read. After receiving an advance copy electronically, I printed out various pages and read them as I did my cardio. So engaged was I in the book that I often found myself working out longer than I had intended. The story moves quickly along from the outset when our hero, Lucius Dante Maximilian Keeva, or Luce, escapes from the secret prison, Never-Never at the bottom of the ocean. He was born to the aristocracy, the son of “Good Man”, each of whom runs a seacity, little fiefdoms built in the midst of the Atlantic. Before his escape, he had tried to take his life and wondered why the wardens worked so hard to keep him alive. Given the tensions with his father, he thought the old man would be content just to see him die. He talks constantly with Ben, whose older brother Samuel manages the family estate. Theirs is no ordinary form of communication. They had been lovers until Luce killed him to spare him the pain of further torture. His late lover’s voice will guide him even after his escape. Once a free man, Luce learns that both his father and brother have been killed, yet when he returns home to claim his own, he finds that things aren’t exactly as he imagined they would be when he wielded power. As a Good Man himself, he starts to wonder how his late brother, when he briefly served as Good Man, came to act more like their father, even in his choice of bedroom decor and at the interest Samuel’s oldest son, Nathaniel takes in him. In short, they want to restore the republic. Luce soon learns that many of his household staff had joined the movement and were named for the Founders, his first lover in honor of Benjamin Franklin, his second for the under-appreciated Revolutionary War general Nathaniel Greene. A Few Good Men is thus the perfect book for gay patriots, a story about two men who fall in love while joining a rebellion that honors the Founders of our republic. Not just that, it’s a fun-faced read, perfect to download to your kindle or iPad to entertain you while you work out. The book’s strength is not just its patriotic themes, but that it tells the story of a gay man who is willing to risk his life for his beloved and his beliefs. These gay men are portrayed not as whiny weaklings bemoaning their fact, but as confident leaders, willing to take charge of their destiny. And Hoyt’s gay protagonist, instead of being a victim, becomes a hero, finding both a man to love and a cause to reverence. A Few Good Men is a book to savor — and to celebrate.